Americans working abroad may be eligible to use Foreign Housing Exclusion and Foreign Earned Income Exclusion. This way you can exclude certain foreign earned income (wages, compensation for services) from US taxable income. As well as certain foreign housing costs paid by their employers. The exclusions apply regardless of whether any foreign tax is paid on the foreign earned income or housing amounts. These exclusion benefits can be claimed only if a US tax return is filed within certain time deadlines. Those who have dropped out of the tax reporting system risk losing these valuable tax benefits. Unless they take a prompt action to correct the filing situation. They are also at risk for very harsh penalties including FBAR penalties. • Making IRA contributions when there is no income or not enough income subject to tax because of the FEIE. Note: “earned income” means just that – income that is earned for services performed. A foreign housing exclusion (FHE) is available for certain amounts of overseas housing expenses paid or reimbursed by an employer. Allowable housing expenses are the reasonable expenses (such as rent, utilities other than telephone charges, and real and personal property insurance) paid or incurred during the year by the taxpayer and reimbursed by the employer, or paid on the taxpayer’s behalf, for foreign housing (including those of the spouse and dependents if they lived with the taxpayer). The rental value of housing provided by the employer in return for services can also be covered by the FHE. Allowable housing expenses do not include the cost of home purchase or other capital items, wages of domestic servants, or deductible interest and taxes. 2. a “base housing amount” which is 16 percent of the FEIE. The difference represents the maximum amount of housing allowance that can be excluded from income. Note: the exclusion does not apply if you own your home and are paying a mortgage. For an individual to qualify for the FEIE and FHE, a “tax home” must be maintained in a foreign country and either the Bona Fide Foreign Resident (BFR) or Physical Presence Test must be met. Generally, a “tax home” is the location of the main place of business, irrespective of where a family home is maintained. If the nature of a person’s work means that there is no regular or main place of business, then the tax home may be the place where the person regularly lives. A person is not considered to have a tax home in a foreign country if the person’s household is maintained in the US. Temporary presence in the US (for example, for vacation or for employment), does not necessarily mean that the household is in the US during such time. To meet the BFR test, a person must be a bona fide resident of a foreign country for an uninterrupted period which includes a full calendar year. A resident is one who, based on the facts and circumstances, has established a “tax home” and has in effect settled in that country. Green Card holders living in a foreign country can also qualify under the BFR test under certain circumstances. The first year overseas, it is common that the BFR test criteria cannot be met because the taxpayer has not been living in the foreign country for an uninterrupted period which includes a full calendar year. In this case, a taxpayer might plan to satisfy the Physical Presence Test to maximize the exclusion, or apply for an extension of time to file the tax return until the taxpayer has stayed in the foreign country for a full calendar year in the following year. To meet the Physical Presence Test an individual must be a US citizen or a resident alien, who is physically present in a foreign country or countries for 330 days in any 12 consecutive months. The 330 days do not have to be consecutive, but they must be whole days present in a foreign country. Travel time does not count toward the requisite 330 days if the travel is in the US or its possessions for periods of 24 hours or more, or takes place over international waters. Recordkeeping is critical. The Physical Presence Test often helps an individual on short assignment. It also enables an individual to come back to the US for short periods (generally up to one month) in any consecutive 12-month period and still qualify for the exclusions. The exclusion benefits can be claimed only if a federal tax return is filed within certain time deadlines. Many Americans are under the mistaken belief they do not need to file returns if their income is below the exclusion thresholds. They risk losing the benefits completely unless corrective action is taken. Delinquent taxpayers may claim the exclusions even if they did not file their tax return within the certain mandatory time period after the due date if a special simple procedure is followed. This is generally possible for any tax year, no matter when the delinquent return is filed so long as the IRS has not taken the first step and notified the taxpayer of their delinquency and that tax is owed. If this happens, the IRS can completely deny the exclusions (meaning higher tax will be owed, thus, higher interest and penalties). It is best to remedy matters before being notified by the IRS since such notification means there is a very likely possibility of being prevented from taking the tax beneficial exclusions. Professional tax advice is the best course of action; back returns can be prepared quickly and correctly. Filing is generally required by 15 April of the year following the tax year in question (for example, for the 2011 tax year the return is due on 15 April 2012 – but since this date falls on a Sunday, the return is due on April 17th). 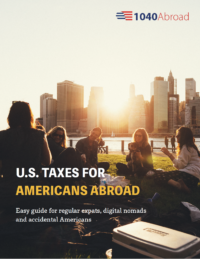 Americans living and working overseas are generally entitled to an automatic two month extension, so returns are due 15 June. If tax is owed, interest will be assessed for the two month extension period. For this reason, many taxpayers pay a projected amount of tax by the April due date in order to stop interest from accruing.